Was happy hearing from a High School friend, Cathee. Thanks my friend for this recipe! Hi! How are you? I guess we all got busy jumpstarting our careers and later became preoccupied with starting our own families. I’m just so glad and thankful for the wonders of modern technology. I’ve happily reconnected with most of our batchmates and schoolmates through Facebook and from time to time, get a chance to chat with them online. Maybe I should keep you up to speed with what has happened to me over the last many years or so. When we graduated from the university, I began my corporate life with what was Aboitiz Shipping then (now known as Aboitiz Transport System Corporation) and built a career in the Training and Development arena. By 1998, I moved to Cebu to fill in a vacant Training position there. It was so overwhelming for me as I’ve never been away from my family and comfort zone until then. Slowly, I got used to independent living and later on, learned to love and appreciate the freedom I had. It was in Cebu where I met my husband. I met him in the middle of 1998 and we got married three years later. In late 2001, my hubby made a career shift that brought us to General Santos City. By this time, I had left corporate life to concentrate on building my family life. With so much time on my hands and my husband busy with out-of-town trips, I busied myself at home by getting reacquainted with cooking. As a young girl, I’ve always loved to cook and learned so much about it from my Mom and Aunt. Like them, I took the “ouido” style of cooking…I rarely measured my ingredients and would mostly go by look, feel and taste. Being away from home, I had to learn old family favorites like Mechado, Adobong Batangas, Sinampalukang Manok and Adobong Pusit so that I wouldn’t miss them so much..Marrying a Cebuano, I was able to stretch my food repertoire to include Visayan fare like Utan Bisaya, Tinolang Isda and Inun-unan, While the training room or conference room was my kingdom during my corporate days, the kitchen became my dominion beginning early 2002. Suffice to say, I lord over it until now and have no plans to relinquish it anytime soon. By the time we got reassigned to Butuan City in early 2007, our family has grown to include my firstborn son, Jarred Andrei, who is now 7 years old and Caitlin Alyssa, 3.5 years old. When we moved to Butuan City, hubby gifted me with my very own range oven. With my new cooking buddy, I started to reunite myself with an old love – baking. Armed with loads of baking recipes from the web, I experimented with all sorts of cookies, pastries and cakes. Over the Christmas holidays in 2008, I went full swing with baking and used my creations as gifts for family and friends. I also learned several other recipes that make use of baking. One of these is your famous Baked Macaroni. It became the highlight of our Noche Buena feast that year. Other goodies I’ve learned to prepare using the oven includes Meatloaf (which is my Mom’s specialty), Roast Chicken and Oven Fries. Last year, we welcomed another addition to our growing family, another girl, Cathleen Janelle. With hubby and three kids below 10, my hands are full with Mommy duties. Cooking and baking have become great ways for me to express myself and at the same time please my hungry brood. My two older kids love to see me in the kitchen all the time and they’re always excited to find out what surprise I’ve concocted for them every meal time. 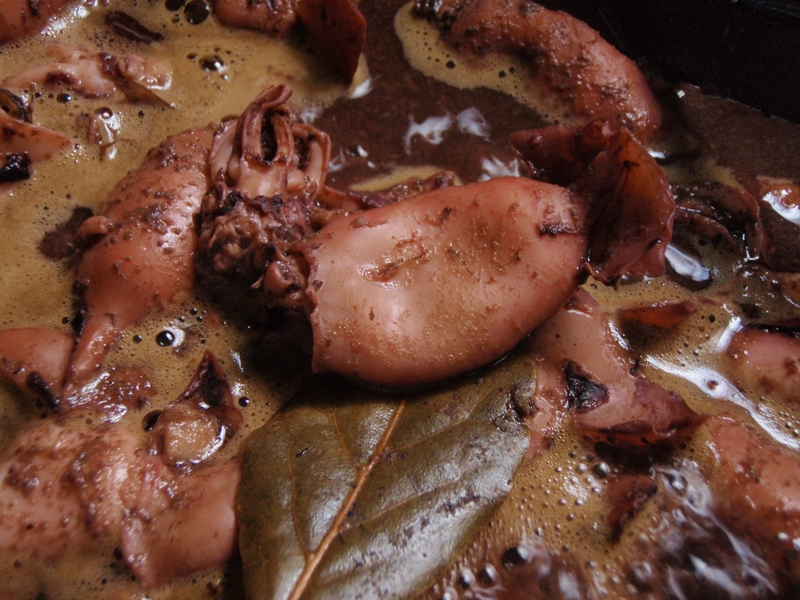 And so from my promdi kitchen, I share with you a family favorite – ADOBONG PUSIT. I hope you and your readers enjoy it. I’m looking forward to more foodie discoveries on your food blog and maybe in the future we can have a cooking marathon webcast through Skype. Wouldn’t that be something? Anyway, here’s the recipe and I hope you’ll like it. In a casserole, place the ginger, bay leaves and half of the garlic at the bottom. Put the squid over this layer, add in the salt and vinegar. Cook over medium heat until it comes to a boil. Add a little water if it gets a bit dry. Remove squid and sauce from the casserole. In the same casserole, heat some oil, then saute the onion, remaining garlic and tomatoes until wilted. Add the squid pieces first and simmer for 5 minutes. Put in the rest of the sauce and dash of pepper to taste. If you want some flair, you may add in a cup of coconut milk (if you decide to go for the coconut milk, do not add any water at all during the entire cooking process) towards the end and simmer for a couple of minutes before turning off heat. Saw you at Conti’s Gbelt a few weeks back but you were busy talking to someone. Anyway, see you around!